STUNNING 4 Bedroom 2 Bath remodeled home plus office/bonus room & private pool, cul de sac lot, no neighbor to the east, 3 car garage & 10 ft RV gate. Interior boasts wood plank tile, crown molding, 2 tone neutral paint colors, upgraded lighting & plumbing fixtures. 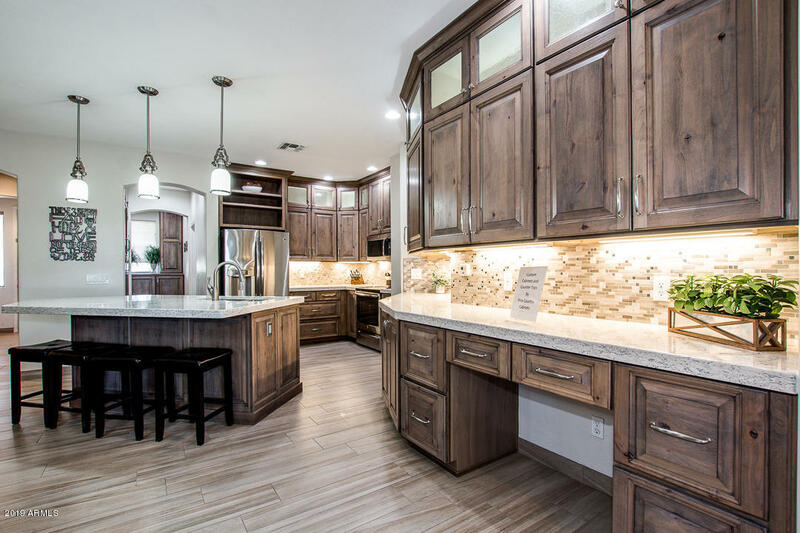 Spacious kitchen has gorgeous custom knotty alder, all wood cabinets, quartz counter top, soft close drawers & cabinets, glass fronts w/back lighting, center island w/breakfast bar. A shiplap wall adorns the dining area with custom overhead lighting. Adjacent great room has lots of natural light, surround sound (with outdoor speakers for the pool), wood plank tile w/herringbone pattern, B-I cabinet holds flat screen. The master suite has W-I closet & new double sink quartz vanity, maple cabinet w/smoke stain AND Gemcor ... waterproof flooring, garden tub and separate shower. The guest bedrooms have ample room, carpet and ceiling fans throughout. The laundry room has new white upper and lower cabinets with quartz counter top and utility sink. New insulated garage door has Wifi opener, belt drive with "Ultra Life" nylon rollers for super quiet and smooth performance. You'll love relaxing in your back yard with private pool and plenty of room for your enjoyment! Also just freshly painted exterior. Don't miss this opportunity.. come see your new home! !